The fans’ favourite extends his third spell with the club. Kenny Browne clears the ball against Cork City. WATERFORD HAVE CONFIRMED the re-signing of defender Kenny Browne. The centre-back initially joined the club from Cork City in 2017, and has today signed his third consecutive one-year contract at the RSC. This continues Browne’s third spell with the club, having first joined from local side Bohemians in 2004 and rejoined for the 2011 season from Sporting Fingal. Browne made 27 appearances for the Blues last season as they gatecrashed the top four of the top division. Speaking to the club’s website, Browne said that he is “really happy to be back. “Pre-season is all about fitness and getting ready for the season, it’s never easy, but that’s what I’m working on at the moment. Training has been good, there’s some really good, young, quick lads after joining the squad and they’re hungry to make a mark. Manager Alan Reynolds hailed Browne’s return. “Kenny is a fans’ favourite here so it’s great that he’s signed for the new season. He showed his quality again last season and he’ll be an important player. “He has lots of experience in league football but also in European football so we’ll look to use that to help some of the younger lads this season. He’s played with Cork, St Pats and Sporting Fingal so he knows what we need to do. Waterford kick off their season at home against Shamrock Rovers on 15 February. Email “Waterford confirm return of defender Kenny Browne ahead of new season ”. 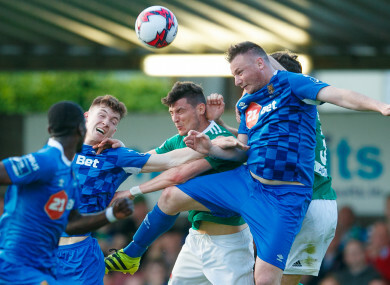 Feedback on “Waterford confirm return of defender Kenny Browne ahead of new season ”.